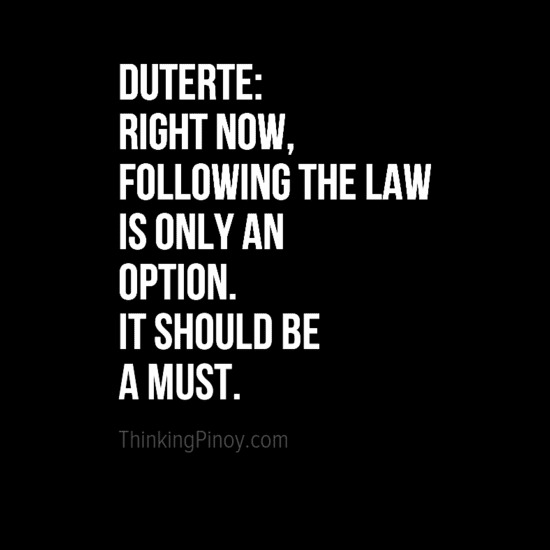 What will Duterte do? 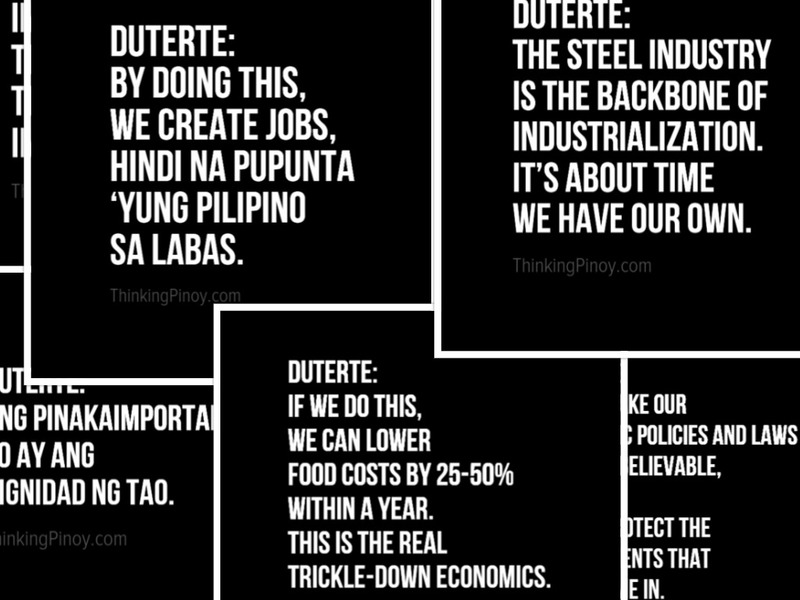 Duterte enumerates specific details of his goverment platform. No jokes, no cussing, no sarcasm, at last. On its YouTube account, The Philippine Star uploaded a video clip where Duterte answered questions about his platform of government, should he be the next president. A couple of hours later, the video was pulled out from the site for unknown reasons. Fortunately, a diligent netizen was able to record it and a copy is now spreading online. Here's the full transcript of the said 12-minute clip. The video is also embedded at the end of this article. Public Order: Inspire Filipinos to be disciplined so future Filipinos can inspire each other to do the same. Economic Policies: Make our economic policies and laws simple and believable, protect the investments that will come in. Foreign Investments: Creation of Free Zone-type "business islands" to encourage investmentand create jobs. 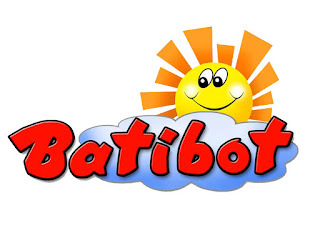 Education: Implied the return of children's TV programs, so the question is... ibabalik ba niya ang Batibot? ThinkingPinoy is a certified Batang Batibot. 1: How will you fix our country if you get elected president? Let me tell our countrymen that I cannot do it alone. This is our country and [we] must have unity. We have enough laws but we do not implement or follow the law. Right now, following the law is only an option. It should be a must. To have peace and order, we must have an adequate police and military force and we should overhaul the entire system and even the hierarchy of the two fighting forces of our government. We should have an increase of their salaries and take care of their families so they do not have to take bribes and they have to work with pride. Ang pinakaimportante po ay ang dignidad ng tao. At [sana] naman, sa sweldo lang sana mabubuhay sila ng marapat-dapat. 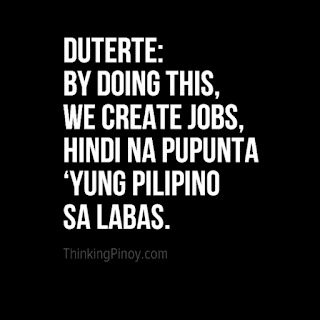 The only way to do that is really… increase their salaries, kasi talaga ngayon mababa at hirap sila. The most important part in the security of our nation is to have an efficient and effective military and police. Therefore, we have to care also of their welfare, but while waiting to perfect the system, we can call upon our citizens to enforce the law and make arrests for after all, it is already allowed under the present laws of the land. 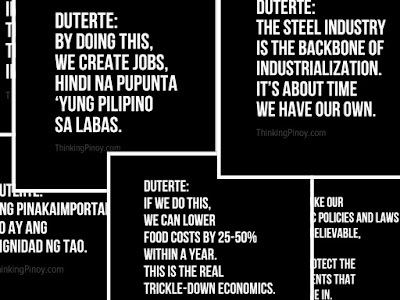 Lahat naman tayong mga Pilipino, we want to fix our country. Sa Davao, I have inspired them to make the city great at nagawa niya. Nagawa ko, kaya natin, kaya ninyo, and we can inspire the whole of the Philippines. It’s a matter of love of country again. As president, I have to enforce the law, and I have to instill discipline, and that is the only way we can go forward in this country. Strong leadership, and the people would want to obey the law. 2: To sustain peace, we must have progress, how do you intend to improve the economy to create jobs? 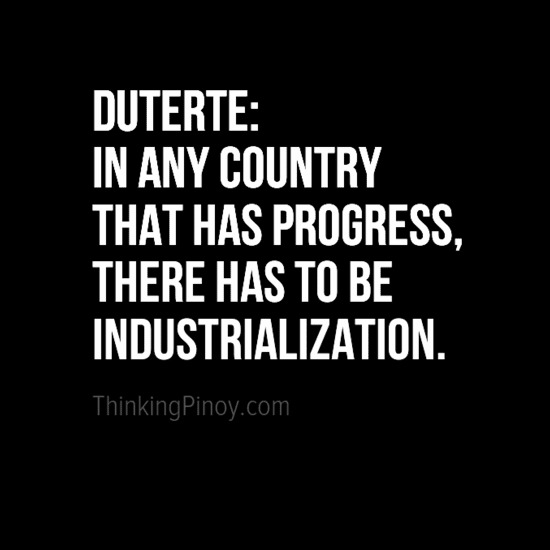 In any country that has progress, there has to be industrialization. To create jobs, we must create factories, we have to build industries. We have to realize our long dream of having our own steel industry. For example, we export ores and the raw materials for steel, and we buy them back as a finished product, compounding the expense. Steel is needed everywhere. It is as a matter of fact, the mother of industries. Everything you see around comes from the earth called steel. 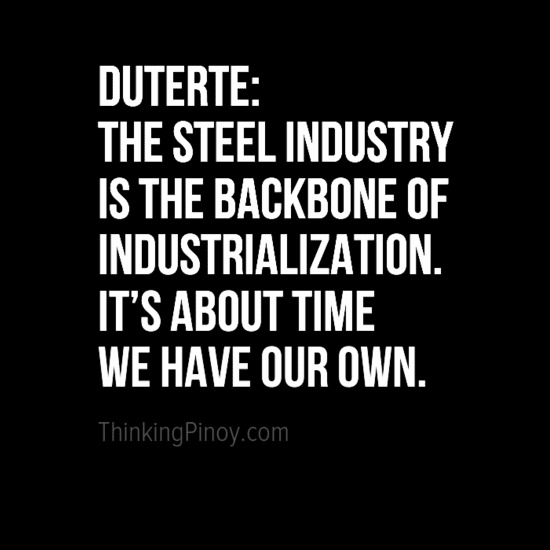 We generate jobs, pati ako nagi-iimport pa ako ng steel para sa bahay ko. Our steel mill can do it for us to build our weapons, our cars, and someday we can build all of our needs in this country, if we have the steel mills. 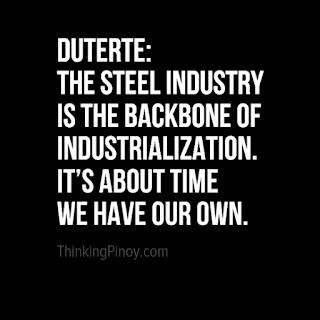 Nagawa ng Taiwan, Japan, South Korea, and other nations sa kanilang steel industry. Nauna pa tayo sa lahat noong 1960s (Ilagan Integrated Steel Mills). Tingnan mo ngayon, nag-iimport tayo. Galing ang raw materials sa atin. TIngnan mo ang South Korea and the rest of Asia, they are progressing and they have the steel industry to rely on. The backbone of industrialization. It’s about time we have our own. We will welcome investors and we will fix our laws and come with the Code of Economics. We will open our country for business, for investments. We will give investors more [incentives] than what other countries are giving, better than what other countries are giving. The problem with the Philippines today is that we have the laws that are convoluted and the red tape is really a disturbing problem. I will assure you that I will make our economic policies and laws simple, believable and protect the investments that will come in. Alam mo, sa siyudad ko, I have imposed this rule of acting on whatever: permits, clearances, a 72-hour limit. Kapag hindi mo nakumpleto ‘yan o pag hindi mo ginawa within 72-hours, you are no longer allowed to release it to the person concerned: you have to give it back to my table with an explanation why it took you more than 72 hours to act for the papers. At ako naman, ang policy ko is, ‘pag may diprensya ‘yong isang opisina – especially corruption, mga fixers – I go into a complete change. 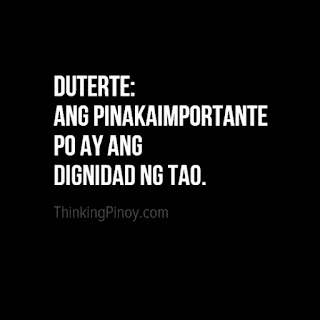 Chief of office, hanggang janitor, (I fire them), yan ang policy ko sa tao ‘pag nagkamali. And even police. Hindi lang may police dyan and there is a lucrative drug business inside the city. I will change the police and every policeman. ‘Yung kasalanan ng isa, kasalanan ng lahat ‘yan, lalo na if it involves people connected with security. 3: You have mentioned that the Philippines is many islands and since foreign business know exactly what they need, we can lease an island to them where they can build their factories and businesses according to their needs and rules like a “Business Island” patterned after Hong Kong. One way to do it really is to attract people. Now there are islands available here in the Philippines. It can be small, it can be big, but if it suits well to the business, eh parang ibigay mo na sa kanila without really giving up anything in the Filipino. Parang yung isang island nila parang factory na nila. They can run their own show, discipline people there, and they can configure the island to their needs. Instead of a factory, I give you an island. Put your business there, obey the laws of the Republic of the Philippines, and you can tailor the configurations of whatever you want in that island, only [on the condition] that we could ask or demand that you protect our environment. 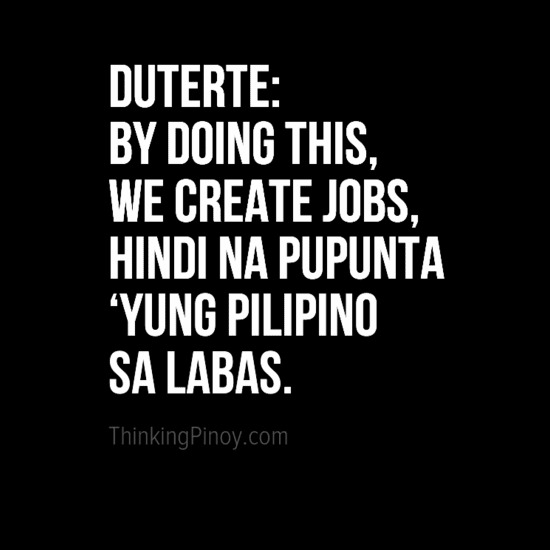 By doing this, we create jobs, hindi na pupunta ‘yung Pilipino sa labas. If we create jobs here within our borders and within our islands, and they (investors) can do business and (create opportunities for) the livelihood of the people as well. To cite to you two counties: Hong Kong, Singapore. Hindi na sila lumalabas sa bayan nila para magtrabaho. Business attracts its own people in their own boundaries. Dapat gano’n ang mangyari sa atin. 4: How will you lower food cost? 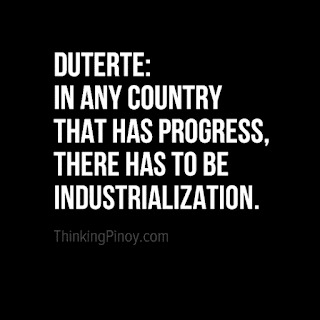 The problem with the Philippines today is lack of infrastructure. Kung mahirap ang daan and there are no roads at all, and the people have to buy goods from the outside of the province or city, the freight (costs) alone will kill you, at kung walang magandang daan, mas magastos, kasi mas maraming gasolina ang gagamitin. And one other (problem) also (sic), is ’yong mga checkpoints ng pulis, kasi kung magbibigay ka (ng suhol) sa mga checkpoints, ultimately, itong nalugi nila na pera o ‘yong mga naibigay nila sa kung anu-ano ang mga checkpoints diyan sa highway, icha-charge doon yan sa mga consumer. Dapat mawala rin ‘yan. Dapat ang daan maganda at mabilis. … and the safest, safe ‘yong pagdala ko sa goods from one province (to another). 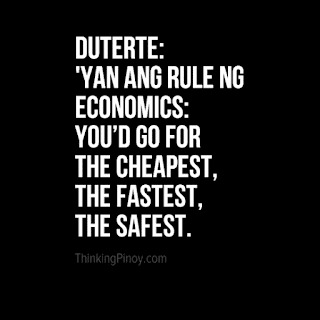 Iyan ang rule ng economics, you transport the goods because there is law of supply and demand, certain goods are needed in other place(s) or merong isa dito, ikaw ‘yong nag-eexport sa ibang bayan, you’d go for the cheapest, the fastest, the safest. Well, one factor really is the craving for profit. 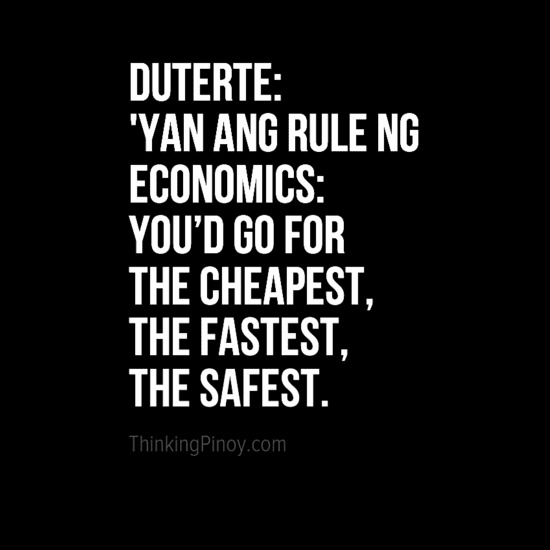 Bibilhin ng mga middlemen, kaya galit ang mga komunista diyan, iyong kubrador, because they double the price and also because of the checkpoints, kung anu-anong bilihan nila, kung anong bigyan, and they will add it up to the consumer eventually. Everybody wants to make a living, some borrow some of their own capital, but the ordinary poor Filipino, he goes to borrow money from the sharks, loan sharks, at matatawg na 5/6 dito sa Pilipinas. And it will add up to the price of the goods you’re selling, tapos iyong nawawala sa checkpoint, and eventually, it is the consumer that suffers. Iyan ang problema dito. There has to be a way where the Land Bank, DBP, or other government financing institutions can lend money to the poor so they can avoid the 5/6. 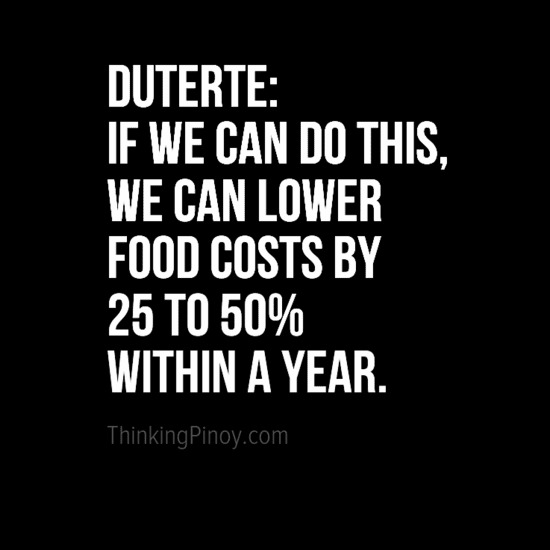 So you must put up… mga bagsakan… food terminals, and the people can have a choice of going to the supermarkets to buy at the higher price o sila ang pupunta for a lower costs sa pagkain. 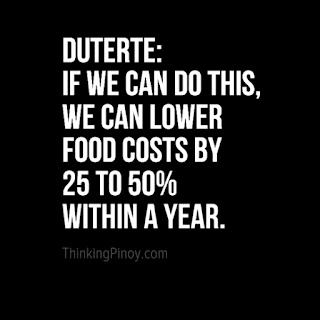 Dapat mapahiram natin, bigyan natin ng mga loans ang ating mga farmers at fishermen para naman may kita sila, the can have a livelihood at the same time , they can sell their products at a lower costs for everybody. If we can do away with the hindraces, obstacles, and we are able to create the infrastructure, I am to lower the food costs in your table by 25 – 50% within a year. This is the real trickle-down economics. To do this we must promote Values Education. Our government, TV-Radio and Mass Media, all the resources should be able to concentrate on educating our children, building character, and we must teach the values of hardwork, ethics, honesty, and cleanliness, self-respect and the molding of character, of self-reliance. The discipline that I started in Davao is now being enforced by the people themselves. I have proven that it can be done. 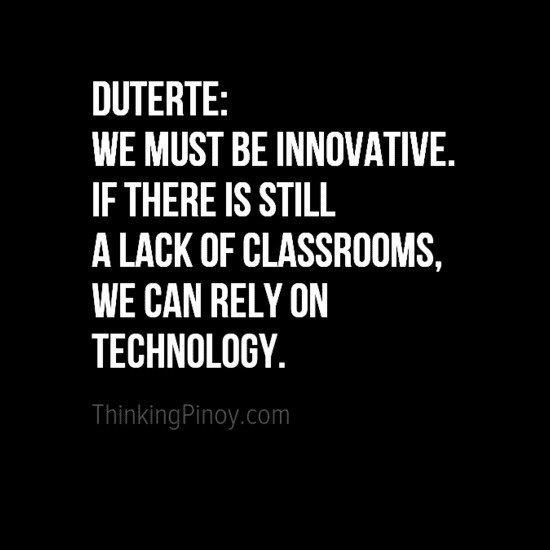 We must be Innovative. 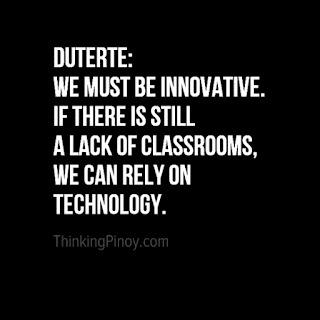 If there is still a lack of classrooms, we can rely on technology… for example, big screens, for the meantime, to teach our children the education that they need. Lastly, we must do our work with dignity. We must be able to realize that to progress materially and spiritually, we must be proud of ourselves and learn the dignity of labor and to respect everybody’s jobs. Author's Note: To learn more about the other 4 presidential candidates, the reader is advised to wait a little bit more. I can post only 1 article per day because of server load issues (I cannot afford a faster web host). I also have a day job that I have to attend to, and maintaining a site like this eats away on my time for sleep (I now sleep less than 6 hours per day). So please, wag masyadong demanding. Intay-intay lang. Peace tayo.